How to drain hot water heater fast and easy - tips and recommendation. Check out how often to drain a heater. What are the problems that might occur if not draining and flushing? What are the benefits of regular maintenance? There are many reasons why to drain a water heater, and one is the most important; to get rid of the debris, sediment and lime build-up from the bottom of the tank. Mineral deposit at the bottom of the tank and heater’s elements could prevent normal heat transfer between the gas burner or electric elements and water, leading to lower efficiency and reduced performance, and frequent user complaints such as “no hot water”, “not enough hot water”, “low pressure” and such. Also, the sediments can block the drain valve which will make draining much harder or even impossible. Heavy mineral deposits could eventually result in water heater replacement as there is no fix for such a problem. Those who live in the area with hard water should drain the unit often, even if the heater is equipped with the “self-cleaning” systems. To prevent the effects of hard water and reduce the risk of sediment buildup, install a water softener. Not only that the device will remove the hardness minerals but will improve the efficiency, prevent future problems and make the unit last longer. It is necessary to drain a water heater when the tank is leaking, removing the old unit or doing some major service on the unit. If you have to replace an anode rod or dip tube you should drain only a few gallons of water, while on some models when replacing the gas control valve or electric heating elements emptying the whole tank is necessary. Another reason for draining is to prevent the heater from freezing or when winterizing the unit. In this case, the whole tank should be emptied, including the plumbing pipes. Draining a water heater should be part of the regular maintenance and is recommended by every manufacturer and experienced plumbers. Draining and flushing the heater's tank should be performed once or twice a year, especially in the area with hard water. This guide applies to conventional tank-type gas heaters, which is slightly different from the electric units. One of the most important steps when draining a water heater is to shut the unit OFF; gas, electric and water supply. Attach the garden hose to the drain valve found in the lower part of the unit and put the other end of the hose either outside or to the appropriate drain. The garden hose is more convenient to use than a bucket. Before opening the drain valve, make sure that the closest hot water tap is open to prevent vacuum generating inside the tank. 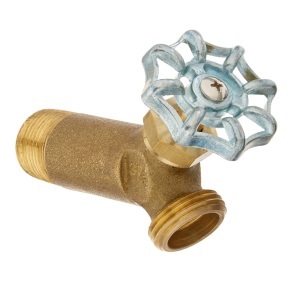 A TPR valve should also be open to release the pressure buildup. Let the hot water run from the tap until it reaches 100 F or less to avoid scalding burns. Open the drain valve and allow the water to drain out. Keep in mind that it will take some time to drain all the water especially if the tank has a capacity of 50 gallons or more. After draining the tank, open the cold water tap to flush out the remaining residues. Repeat this process until the water runs clear from the tap. Close the drain valve and TPR valve and refill the tank. Follow the procedure for lighting the gas heater or flip the breaker to restore power to the electric type. Note: Some tanks must be full of water to avoid damages on the heating elements and gas burner. Note: The heater should have easy access for operation, maintenance, and service. Some storage-tank heaters are equipped with the plastic drain valve while others use more reliable temper resistant brass drain valve. The thread size is the standard 3/4 inch. They come installed on the unit. Some plumbers are recommending installing ball valves instead, for simpler draining. If flushing the water heater often, you won't see much of the water with the color changed, but if this is the first time after many years of using, be prepared to see brown, rusty water and other deposits, coming either from the sediments and limescale build-up or corrosion. Drain the hot water heater regularly and watch how the heater can last and operate for many years efficiently and with the lower costs.